Cuban heavyweight contender Luis Ortiz, by his own admission, and that of his promoter, was dissatisfied with the decision victory he pounded out over Malik Scott last night in Monaco. 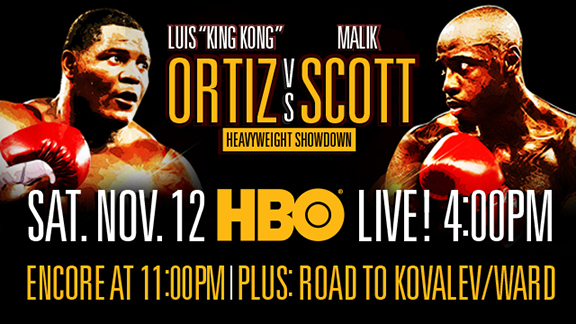 Ortiz, who won via lopsided scores on the three cards, blamed Scott’s negative tactics for the dull encounter. Ortiz wanted a showcase in his Matchroom debut but it failed to materialise. Fans are split now on whether or not the powerful southpaw is as good as it once appeared. Any fighter can have a less than spectacular night, and Scott was less than willing to go to war, but is Ortiz the big threat to the likes of Deontay Wilder (who of course crushed Scott inside a single round a few years back in a non-title fight) and Anthony Joshua that many felt he was? Is age catching up with Ortiz who, at 37, is no spring chicken? It will be interesting to see who Hearn finds for Dec 10, a pretty quick turnaround for a big guy. Will future Ortiz opponents look to mess him around and outbox him though? Stand and trade with “King Kong” and you run the risk of being taken out, but maybe a fighter with a more aggressive version of Scott’s game-plan will decision the Cuban. Who would be looked at as the favourite to win now between Ortiz and Joshua? There are still potentially exciting fights out there for Ortiz, 26-0(22) but time might be running out for him. Having been taken the full 12 rounds for the first time, Ortiz’ punching power, or his finishing ability, was just a little bit exposed in the opinion of some fans. Ortiz needed an impressive KO last night, he didn’t get it. If he’s matched right next month, maybe he will register his 23rd KO.